Vintage Hockey Card Sets have played a significant role in growing interest in the sport. 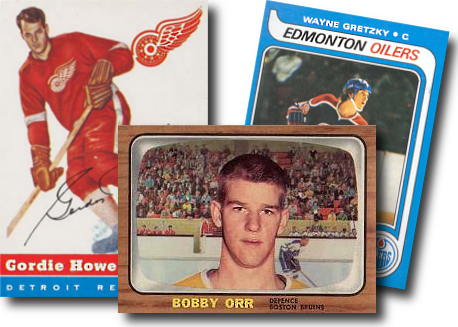 Dean's cards offers a wide selection of hockey cards from Topps, Parkhurst, and O-Pee-Chee, including releases from the 1930s. Again, buying and selling rookie hockey cards and star cards get the most interest from sports card collectors. And everybody is looking for the next Wayne Gretzky hockey star. Please click on the links below to find the hockey cards you want for your collection. Click here if you want to SELL your vintage hockey cards to Dean's Cards.